Microprocessor K.F. 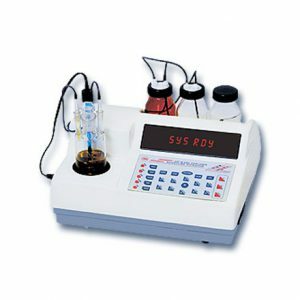 Moisture Titrator 1760 | Electronics India - Manufacturer, Supplier and Exporter of Analytical, Scientific Laboratory and Pharmaceautical Instruments in India. Auto Computation of Moisture in ppm, %& mg H2O. Microprocessor KF Moisture Titrator – 1760 is the finest volumetric titrator available. It uses the latest microcontroller technology and advanced engineering techniques so as to give enhanced accuracy and reproducibility. The system has user friendly prompts which guide you throughout the titration process. This titrator eliminates the use of conventional delicate and fragile glass burettes and plunger systems. It uses a highly sensitive motorized dispensing system for precise control of titrant volumes. This titrator analyses the moisture concentration of liquid samples, powder, fine particles and fiber samples that are soluble in alcohol or solvents. The moisture content is displayed in ppm, %age and mg H2O. The system has 24 soft touch membrane type keys for ease of operation. Complete numeric keypad is provided so as to feed the values of sample, density, titer factor, date, time etc. comfortable. The End Point indication is given by both visual LED and audible alarm. The titrator has the facility for automatically calculating the titer factor of the Karl Fischer reagent. It uses the repeated averaging method so as to give the most accurate titer value. It has the storage facility of date, time, batch no. and final results of 20 titrations using the FIFO method. The internal battery backup ;provision has been made to store the results and the other titration parameters for a minimum of 1 month even if the instrument is not switched ON. Provision for external printer attachment is available so that any of the stored results can be printed even at a later stage. Measuring Method Karl Fischer Volumetric Titration method. K.F. Dispensing Highly sensitive motorized dispensing system. Display 8 digit bright red seven segment display. Stirrer In-built Magnetic stirrer with adjustable speed. Printer Interface External Serial printer interface available. Power Supply 230V A.C ± 10% 50 Hz.